DUE to other commitments, I will not be able to personally update www.austin-rover.co.uk or answer any emails. That means the blogs page could well end up blank for the next fornight. Unless, of course, you, our loyal readers would like to have your say. As you know, I like to encourage austin-rover’s readership to participate in the website’s development and evolution, and that being the case, I always look forward to reading your blogs submissions or letters for the ‘Have your say’ page. So, you see, the site will go on, even if I’m buried in other stuff. If you want to blog for austin-rover.co.uk, simply send your submission to Declan Berridge, and he’ll make sure it gets a sound reading. Before I go, I’ll leave you with one thought. We all have an opinion on the Directors’ salaries that John Towers, Peter Beale, Nick Stephenson and John Edwards have taken for themselves during the last five years – and how if there were some semblance of justice in the world, they would have been paid a salary commensurate to their results. Well, we don’t know for sure, but what they have taken home during the past five years amounts to millions, and that they are still working for Phoenix Venture Holdings, while most of Longbridge’s employees lost their jobs during April and May. That being the case, isn’t it about time that these guys gave the money (as they offered to do back in May) to the trust set up for the newly unemployed workforce of Longbridge as well as MG Rover’s dealer, service and supply network? REPORTS are coming out of PricewaterhouseCoopers that MG Rover has been purchased by Nanjing Automotive, with The Times putting the ﬁgure at £60 million. The company’s been around since 1947, but it’s not the best known Chinese automaker. (In China, it puts together Fiat Palios and the Mk I Seat Ibiza.) However, it could be from this point. To draw a western analogy, Nanjing is sort of where ABC TV was before Charlie’s Angels came along. There are still some intellectual property issues to sort out, but the picture appears to be a relocation of volume car manufacturing to Red China (makes sense, given labour costs) with specialist car manufacturing retained in Great Britain (also makes sense, given British expertise and the higher prices that can be attained). Nanjing’s move makes sense from its own brand perspective. Nanjing now has some old brands under its belt, probably including the coveted MG, which places the company in the same position as Lenovo or Haier. Sixty million pounds is not a lot to pay for MG’s 80-year history and a fast-track to exports for the loss-making Communist-state-owned manufacturer. They will get it back through the premium their goods will sell at: if they thought Phoenix was doing well out of the CityRover, then they will be quite pleased with their proﬁt per unit. It will likely be the ﬁrst Chinese automaker to sell in Europe, well ahead of the big boys who are still building cars under licence, with the exception of Geely and China Brilliance (who have no recognizable brands). It’s the sort of example you might expect to find in one of (co-author) Simon Anholt’s insightful books, such as his earlier Brand New Justice, and Nanjing could prove, finally, that brands are more important than ﬁnancial wizardry. Whether or not Nanjing can sustain the manufacture is another matter, but brands have a funny way of propping things up and helping a company weather the worst. And with the faltering of one of its domestic JVs, there may be capacity for some Rovers popping out of a Red Chinese factory. Let’s hope this acquisition not only helps preserve some British jobs, but overall can bring greater equity to global incomes. Through that, we all gain. JUST after 6.00 this evening, the news finally came through – Nanjing had bought MG Rover’s assets in a deal brokered by PricewaterhouseCoopers. It seemed fitting that I had been returning from Gaydon on a day that I had met the chaps from Retro Cars magazine to discuss the past, present and future of MG Rover, and what it was about the company and its antecedents that seemed to engender such passion in people. It will be interesting to see what Nanjing does with Longbridge and MG Rover. Some people are suggesting that there is the distinct possibility of a re-launch of the ‘Austin’ marque, as well as further development of the MG marque. The purchase has raised many more questions than it has answered, and it remains to be seen how the Chinese company will handle Longbridge – and whether production of any of the existing lines will re-commence. I suspect given SAIC’s protestations over the IPRs it is alleged to own, there could well need to be an accomodation reached between two companies, which nearly got into bed with each other during the latter stages of the MG Rover Joint Venture Company (JVC). I certainly welcome the news that the process of administration is coming to a close, and a buyer has been found for MG Rover – and hope Longbridge continues to build cars, as well as becomes some kind of centre of excellence for a Chinese company with global ambitions. WELL, it was certainly an interesting weekend. We now know that SAIC/Magma are going for MG Rover, and intend to build a similar company in the UK (with Martin Leach heading the management chain), as it intended to with MG Rover. The only difference being that there will be no pensions or other liabilities for the Chinese to worry about – and it probably doesn’t even need to give anyone guarantees about continued car production in the UK. Yes, it’s a Chinese takeaway, but I guess it’s employment and continued car production in Birmingham. SAIC has confirmed car production will continue in the UK, although won’t commit to numbers for obvious reasons. Then we have the English contingent – led by Triple-A (Martyn Moseley and Krish Bhaksar) and David James. Confusion reigns over this, not least because both parties claim to be talking to PwC – whereas PwC states that it is only dealing with one UK-based bidder. One thing is for sure, Triple-A certainly believes it is in the race to win MG Rover, and with a product plan based around the Lotus VVA system (as proposed by Chapman Automotive some time back) there is much interest here. There’s also talk of substantial investment from Taiwan and the USA – which is nice. If contracts are won on the strength of a bidder’s openness, then Triple A would be ahead at the winning post…. However, some very good news brightened MG Rover fans – at just gone 4.30 this afternoon, a joint press statement for Magma and SAIC announced that the two parties had joined forces to bid on MG Rover’s assets. If there was a familiarity to this business model, there should be – essentially, it was the MGR-SAIC joint venture project, but with different management, very few financial liabilites. The aim of Magma is to produce cars and engines at Longbridge, and become the Euroean head of R&D for SAIC. Okay, the terrible events that led to Phoenix calling in the receivers meant that 5500 workers at Longbridge and a whole load more in the sales and supply chain have been lost, and that damage will not be easily repaired. Especially to the communities in Birmingham which have had their hearts ripped out of them. But after a couple of months where the thought of renewed production at Longbridge looked like a lost cause, this is good news indeed. And I must admit that for the first time in months, I am beginning to feel a little less than dread when I ponder the future of MG Rover. Sorry to sound negative about this, but I cant see any hope of getting meaningful car production back into Longbridge. 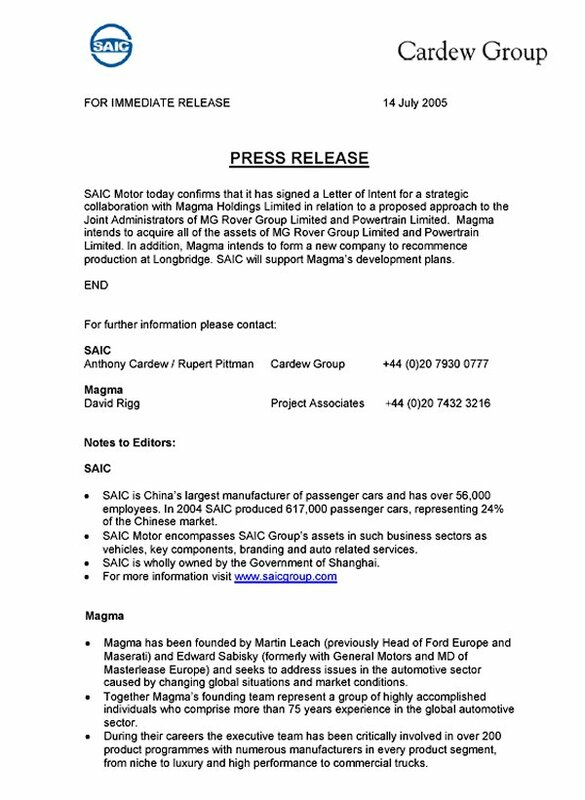 The SAIC/Magma/Martin Leach deal just looks like a round about way for the Chinese to get their hands on the remaining MGR bits they need to start production in China, without appearing to be the asset strippers they are. There was never any incentive for SAIC to enter into a deal that involved building cars in the UK and there still isn’t. Think about it. To get Longbridge back on line will inevitably mean building previous models in the short term. No one wanted to buy them before MGR went into administration. The resultant collapse in sales triggering the end of MGR as we knew it. Will anyone want to buy a new Rover now? especially when the market will be awash with “old” MGR stock on sale at knock down prices for a long time to come. What’s more how will they distribute them? Most former MGR dealers have gone out of business or have already signed other franchises. The economics and logistics of mass producing cars is mind blowing! I just cant see how SAIC/Magma etc can simply switch Longbridge back on and get back to business as usual as these news stories naively suggest. Andy Carr’s 75 Club snuggles up to Mike McCabe’s Connoisseur… and then turned heads. So, if you own a 75 or a ZT and reckon a few impromptu gatherings are in order, drop me a line, and if there’s enough interest, we’ll set something up. The first opportunity would appear to be Peterborough, so if you have a 75 and fancy chatting to some likeminded individuals, come over to our stand and say ‘hi’. If enough people email me, I will try and arrange some space for a 75 ‘car park’. WELL, it was a great day at Longbridge – and seeing such a massive gathering of Austins and various other Longbridge built cars really was worth getting hot and red in the July sun for. I managed to meet a number of really interesting people, and some of the stories… well, they were just great. And that got me thinking… just how mucu detail, and how many blue sky stories are there out there, sat among the designers, engineers, managers and production line workers? Oh, and as for the Centenary event… great stuff. Thanks to Tony Osborne and his wife Patricia, for his hard work in arranging the event, and thanks everyone for turning it up to make it a truly memorable occasion. It’s a shame I’ll not be around to see the next Centenary, really. FIRSTLY I would like to congratulate Richard Jesset for having his lovely 1.8 VVC Coupé featured in Autocar this week. It just so happens to set the theme off quite nicely for what I would like to share with you all. I have now owned my 1995 216 Coupé since March of this year making it the fourth car I have owned. I don’t want to specifically discuss my car, after all I should have spent more, got the perfect example but that didn’t happen. 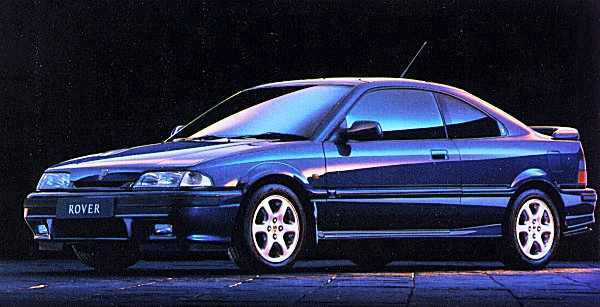 What I do want to discuss is Rover’s 216 Coupé in general. I have come to think of it as a good compromise. What the Rover 216 Coupé offers is a nice and usable blend of performance and economy and fantastic value for money. My car was £1200 and I would suggest you spend more to get a nice one. Having covered many miles, spending a lot of time in traffic, the fuel economy is excellent, beating that of the 1.1-litre Metro, VW Polo and Rover 25 1.4. I have a theory why: because the 1.6 is flexible and well-powered, you find yourself coasting up to speed with ease. It rarely actually feels quick until you blink then realise you’ve added 10mph – when you want it to be quick, it is. At 9.5 seconds taken to accelerate from zero to sixty, the car is not going to break world records, but can you really enjoy more these days? Put simply, it requires less ‘oomph’ to keep up with the flow. It packs the necessary punch to take me pleasantly by surprise. Its ace is undoubtedly its handling, which is fantastic. The way it tucks-in with no fuss is just brilliant for a relatively large car – it goes where you place it. Although, I have often pointed out the 25 was finest for this delightful trait, the newer and shorter hatch takes the biscuit. Ten years more modern, more tweaked in set up… and it’s shorter. The Coupé’s steering is actually lighter than the 25’s but it somehow manages to feel more communicative. Perhaps ‘chunky’ is the only word I can think of. The pedals are nicely weighted and for a shift described by Jeremy Clarkson as ‘notchy’. I find it quite pleasant, direct and smooth enough to be comfortable with. The only compromise here is the stiffened suspension which means it will not ride as well the 25, but it is a car with sporty aspirations. If this is not simply enough – just look at the car. It’s a stylish Coupé possessing genuine credibility, and it’s modern enough to ensure it will stay fresh in the minds of enthusiasts for time to come. It seems to be a great conversation starter, a lot of people like to come up to me and talk to me about the car, complimenting it, without the usual misguided opinions fired at Rover owners. It attracts glances without saying ‘look at me’. It is desirable and has achieved something that in the Nineties, an Austin- or Morris-badged car could probably not. 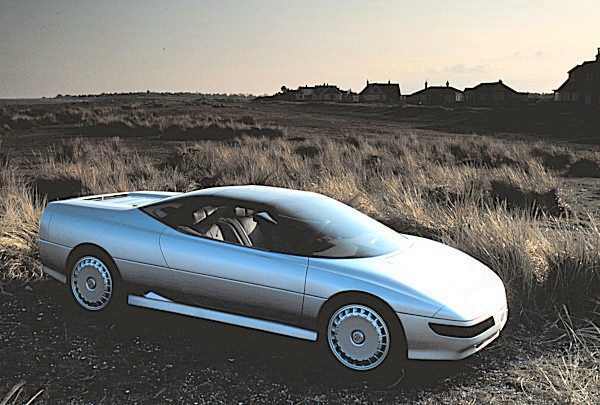 It set Rover on an upward path – sadly closed off when BMW’s wish for ‘olde-worlde’ got in the way. So, to conclude, fuel economy is good, performance is ample, it’s lovely to drive, and it does not give away its age even after nearly ten years and 96,000 miles. The only thing I don’t particularly like are the ‘SEi’-type seven-spoke alloy wheels, and I say that not because I dislike the actual wheels but I think the six and later five spoke alloys suit the Coupé better. I MUST admit that thinking about cars has been difficult today. Watching the awful events in London unfold before my eyes has been traumatic. It reminds one of the fragility of life, and how we should never take it for granted. I sincerely hope the perpetrators of this outrage are caught, and are swiftly brought to justice. If anything positive has come out of the events of today, it is that Londoners really are a breed apart; and that their determination and coolness in a crisis should be applauded. And it goes without saying that the emergency services did them proud. Our thoughts and prayers go out to the families of the deceased. FOR a short while I have been trying to think of a great blog to write to perhaps give something back. The great thing about a blog is it turns ordinary people and our experiences into automotive journalism. 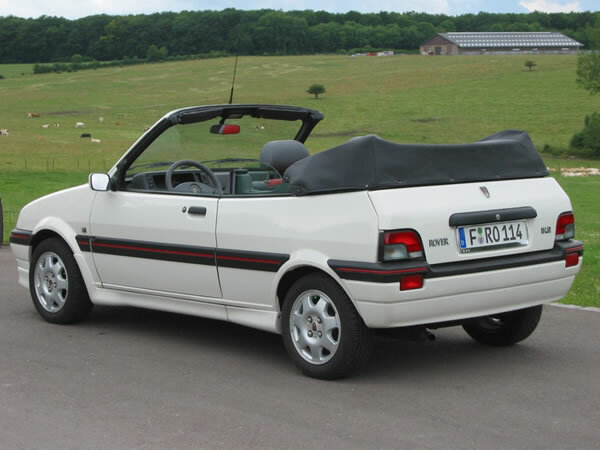 I’ve wanted to write a short piece on the Rover medium sized cars and what they have meant to me since the concept is now some 21 years old, but I got confused whether to start with the Triumph Acclaim or the Maestro and Montego or back further still, and it was quickly becoming like an essay. At the moment though it is hard to write anything without touching on the subject of MG Rover and its collapse, and we’ve all heard enough of that and the variety of reasons, beliefs and opinions that go with that. But what I want to write about today is this site. This site has given me a lot, where else, without special effects explosions, romance and bond girls do events that have taken place up to fifty years ago become so fascinating? If www.austin-rover.co.uk was written as a book it would certainly be the one that you say ‘just two more pages’ before you switch the light off and go to bed! ‘Oh go on; three then’. This website gives us a lot and asks for nothing which is why I feel obliged to write a couple of blogs here and there and contribute to something which has fed my interests and idea. The forums prove still to be a fantastic resource of knowledge and ideas, and often just fun. It’s great to be part of a group like this. It’s like a club, which is why the meeting was great at Gaydon. Austin-rover.co.uk is a community I’m glad to be part of. The blogs are a great way getting across opinions and experiences, and something which I love to check for the latest, so for any body who has considered writing one, please do! BMW must be feeling pretty satisfied with itself at the moment. Having just announced that it intends to dump the Williams F1 racing team at the end of the season in exchange for a full purchase of the Swiss Sauber team, it must now feel completely in charge of its F1 destiny. However, if I were Peter Sauber, I’d be wondering what kind of future the team I had spent so long building is going to have with BMW in the driving seat. We all know that F1 is a mightily expensive game – budgets of over £500m per year are spoken about when referring to the Grandee teams, such as Ferrari, McLaren and Renault – and yet, it has been said (by the new Renault chairman, Carlos Ghosn, no less), that F1 is an investment when you’re winning, and an expense when you’re losing. So what’s this got to do with our website, I hear you ask? Well, Rover was bought at great expense by BMW back in 1994, loads of money was invested, and this cash injection did not bear fruit within a five-year time scale. In the end, the Bavarians gave up, with the winning post in site, and allowed the British company to continue on its long path towards oblivion. Now, it seems, Sauber has been picked up for a huge amount of money from BMW, and doesn’t realistically look likely to start winning in the medium term… So will it last more the Rover’s six years? I think this is a very relevant subject; BMW are nothing if not consistent. 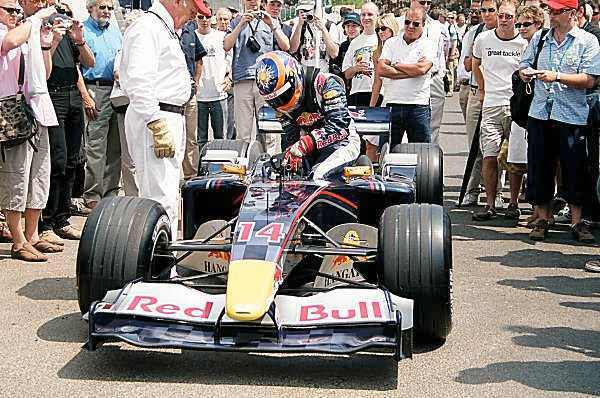 Leaving Rover aside for a moment, this isn’t the first time they have dumped a partner company — they were the (turbocharged) engine supplier to the Benetton Formula One team in the 1980s before pulling out. Rivals Honda, by comparison, are much more touchy-feely, and they don’t give up at the first hurdle (agreed in a way – it pulled out of its engine supply contracts with both Williams and McLaren in F1 a year earlier than scheduled – Ed). 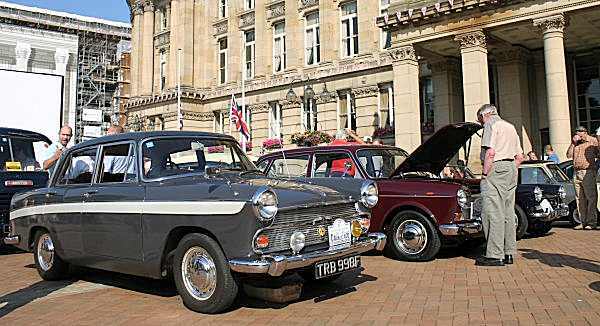 This is demonstrated by their willingness to stick to a partnership arrangement with Rover from the Triumph Acclaim of 1981 through to 1994 when British Aerospace suddenly sold the company to BMW. Contrast and compare Bernt Pischetsrieder rubbishing the Rover 75 at the NEC. I wonder if it’s the Quant family driving the decision-making? Someone is anxious for short-term success, that’s for sure. Toyota’s progress in Formula One after only two seasons must have persuaded BMW that establishing their own team was the way forward. But perhaps they should have been looking at the relationship between Mercedes-Benz and McLaren — both parties there seem to be in it for the long haul, with McLaren badging appearing on the SLR. There was never going to be a Williams badge on a BMW road car, that’s for sure. Peter Sauber said on Sunday that he was 62 and wished to take a back seat. At least he won’t have any financial worries in his retirement. Meanwhile, will have to see just how long it takes for the Quant family to become disillusioned with their Formula One adventures. IT has now been over three months since MG Rover collapsed and we still don’t really know what’s going to happen to it. We have a serious offer from the Chinese company Nanjing on the table, but as far as we can see at the moment, there is little likelihood that its executives are at Longbridge to save the historic factory. In reality, continued production at Longbridge will probably be limited to MG – and that will be in limited quantities, and most likely, will end up being a great successm seeing the marque return to its natural stamping ground, the USA. It could be argued that MG’s message has been diluted of late, with the introduction of the ‘Zeds’, but that assertion couldn’t be further from the truth, especially in the world’s largest car market.